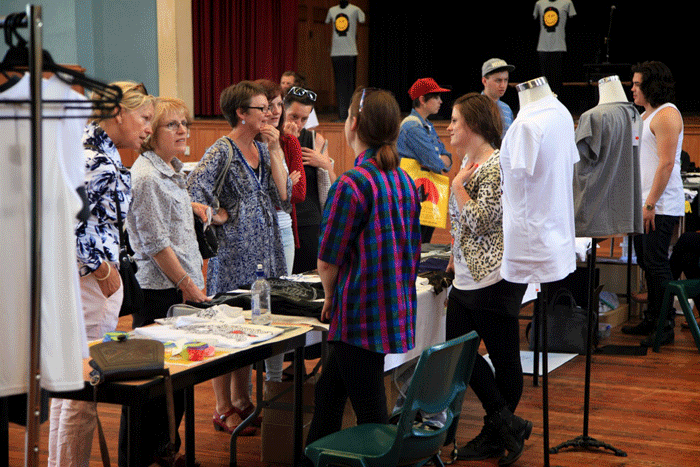 Shirtstock is New Zealand’s first and best event completely devoted to the Art of Tee. Incorporating Design Awards, live screenprinting and other shirt adornment techniques, people’s choice awards, giveaways, the opportunity to peruse and purchase the offerings of a host of labels and a plethora of print workshops. Comments: The strongest print from an experienced t-shirt designer with a very distinct and confident style. Comments: A great quirky one color print with instant appeal. Comments: A simple design with good thought to color detail, a basic yet commercial print that would work well for men and women. The designer we’d like to offer the AS Colour colab print to is Gabrielle who submitted two very strong designs with a great sense of dark humor and irony, we saw something very unique in her style and would be very happy to showcase one of her prints in the AS Colour stores. 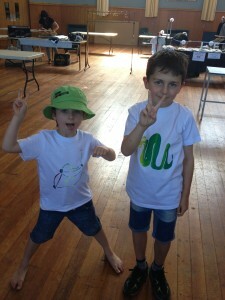 The children’s print workshops were a great success at the 2013 event. Stevie and Nico went home in shirts that they had drawn themselves. Stevie wears a Rattlesnake with glasses and Nico a Giraffe swimming. In a deep pool. Obviously. In 2015 there is going to be paint your own tee workshops for kids on a walk up basis. There will be a range of printed out line tees that kids can paint in the colours, one of the tees is a blank frame so almost literally a blank cnavas. Multiple award winner Everybody will be holding stencil printing workshops on Friday at 7pm and Saturday at 2pm. Limited numbers so please be early. Bring an idea! There is still space in the market for tee sellers call/e-mail or show up early! ShirtStock is the perfect chance for fledgling Labels to gain some exposure and even for a group of students to get together and project their ideas on to the most egalitarian canvas of all. Thousands of tee shirt fans came to the first two ShirtStocks to see the work of the many different design labels on display and vote for their favourite design. They got to mingle directly with the designers and creators of tees; get an insight in to their creative processes and buy Tees direct from the artists. Overwhelmingly the designers and punters were hoping this would become an annual event and now their dreams have come true. A panel of Wellington’s Fashion elite judged shirts in four different design categories and also choose the Best in show from the winners of those categories. © ShirtStock 2013, All rights reserved. | Website by White Tail.